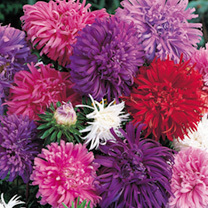 Aster seeds come in 3 main varieties; dwarf, intermediate and tall. 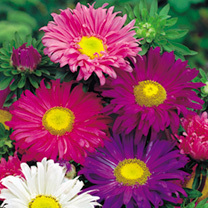 Intermediate and tall produce some beautiful flowers which are ideal for cutting, and putting at the back of borders. The dwarf variety is brilliant anywhere in the garden, but looks amazing in the front of borders. 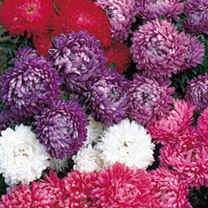 All varieties produce a colourful and vibrant flower. This beautiful half hardy annual needs to be sown between March and May under glass for flowers July to October. Or sow outdoors between April and May. 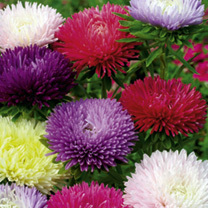 Aster seeds should germinate within 10 to 14 days. Transplant the seedlings into trays 5cm apart and grow on. 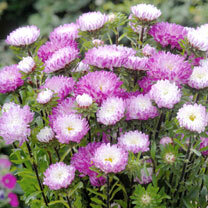 Gradually acclimatise the Aster plants to outside conditions, and plant out at around 35cm apart. Suttons, Woodview Road, Paignton, Devon TQ4 7NG. Registered in England and Wales No. 284448. VAT No 158 9318 27.